In March, 1920, NCCW was founded under the auspices of the U.S. Catholic bishops. The bishops had witnessed the important work done by Catholic women’s organizations during World War I and had the wisdom to call for the founding of NCCW to bring these organizations together. 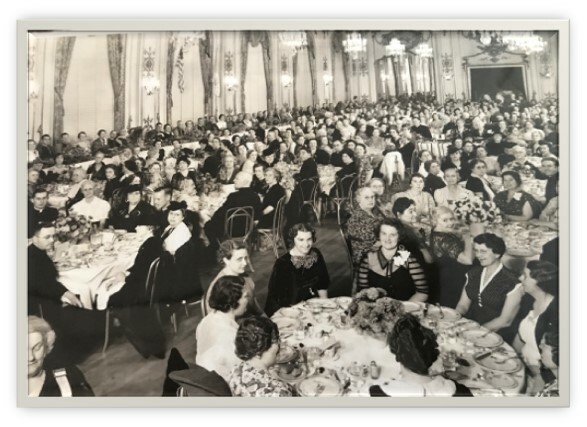 This gave U.S. Catholic women a unified voice, a national service program and the ability to reach out to each other through a national organization. Emphasis was given to the education and formation of Catholic Women so they could exercise their new found civic duties granted them as the “Right to Suffrage” in 1920. 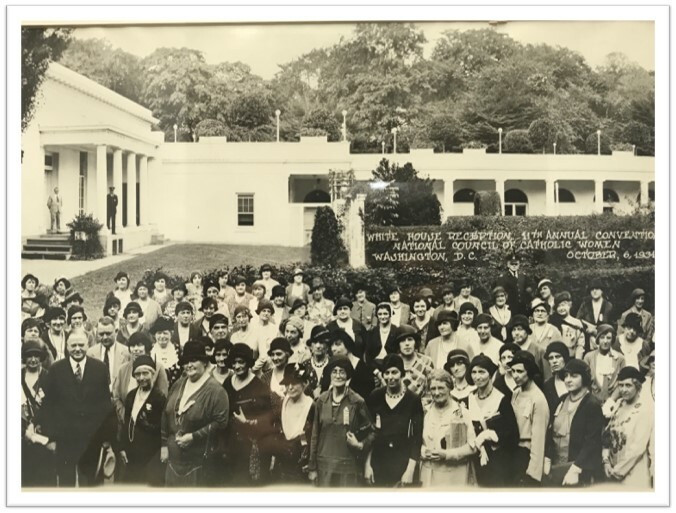 Under the direction of the National Catholic Welfare Council, the NCCW participated in an inaugural program called Immigrant Aid to assist Catholic immigrants with their relocation experiences. Focused on the promotion of Catholic education and the establishment of Parent Teacher Associations, catechetical instruction, and affiliation with university Newman Clubs. Created and funded the National Catholic School of Social Services in Washington D.C., now housed at Catholic University of America. Diligently promoted social justice and world peace and the diminution of armaments among all governments of the world. Promoted the sanctity of marriage and the threat to the family structure posed by divorce and birth control. Affiliated with the International Union of Catholic Women’s Leagues now known as World Union of Catholic Women’s Organisations (WUCWO). Pledged support for the United Nations and its affiliated international organizations. Focused on international relations, just peace treaties, human rights and the opposition of genocide. Started an International Affairs program and collaborated with the National Catholic Welfare Council’s War Relief Services now known at Catholic Relief Services (CRS). Endorsed minimum wage , social security and health insurance legislation. Promoted the Catholic Press and “healthy reading habits” through the establishment of parish libraries and subscription to diocesan newspapers. As a result of Vatican II women began to fill lay ministry roles in the Church. The NCCW established training programs and developed resources to help them fulfill these roles. Launched the Military Council of Catholic Women. Developed a formal leadership training program know as the Leadership Institute : Fashion Me A Person. Commenced working toward an end to abortion and euthanasia. Created and implemented the RESPITE program to provide support for caregivers. Addressed the issue of domestic violence through education and advocacy programs. Collaborated with Catholic Relief Services to establish the Refugee Women Emergency Fund. Created and funded Mary’s Garden at the National Shrine of the Immaculate Conception in Washington, D.C. Created the Water for Life Fund and Madonna Plan to support the ongoing efforts of Catholic Relief Services . Implemented Vocation Purse Club to assist women seeking to enter religious life with their financial obstacles. Formation of a mentoring program, Women Embracing Women. Implemented and continue to implement new communication strategies, through online and digital media platforms such as Facebook, Twitter, Instagram, new databases and updated web presence. Worked to end Human Trafficking with affiliated organizations and US Catholic Sisters. Established outreach program with children in the Holy Land and students in the USA. Established CCW levels for high school and college age women. Provided formal program of formation in our faith for members. Developed series of mini-retreat resources. Established Leadership Training and Development program. Members noted more than 2 million spiritual and corporal works of mercy performed during the Jubilee of Mercy year in our Million Works of Mercy Program. A certificate noting this was presented to Pope Francis in April 2017.